To introduce Emeritus Professor Valerie Brown AO is a daunting task, especially with Val sitting in the audience not wanting to hear what is about to be said by myself and other speakers today who have come under her spell. Still, it is a pleasure to talk about the Val who I have come to know since the early 1970s. Val’s outstanding achievements can be demonstrated through her publications in scientific journals and other scholarly media outlets, and by the dissemination of knowledge in multiple forums. She has published over 200 scholarly papers and 12 books. This year another book written with Dr Judith Lambert AM was published, entitled, Collective Learning for Transformational Change: A Guide to Collaborative Action. Judith is here with us today and brought her wealth of experience to this practical guide to collective learning tested and proven by the work of the Local Sustainability Project that worked in partnership with local communities on whole-of-community change for a sustainable future: over 300 of such communities participated and over 3,000 change agents came on board this sustainability initiative. Val is the Director of the Local Sustainability Project, Human Ecology Program, Fenner School of Environment and Society based at the Australian National University, Canberra, and this book exemplifies her commitment to both practice and ideas. Early next year our book, The Human Capacity for Transformational Change: Harnessing the Collective Mind, will be published. It is both a theoretical and practical book about using this inherited human capacity of ours for addressing transformational change, or Anthropocene, more effectively and building on minds that are collecting and connecting around the world as never before in cyberspace. Both books were contracted by Earthscan-Routledge. There are two other books that I want to mention briefly because of their importance in understanding Val’s achievements. The first is Leonardo’s Vision: A Guide to Collective Thinking and Action was published by Sense, Rotterdam, in 2006. The guru of sustainability, Dr Alan AtKisson, wrote how the book was a rich treasure trove of inspiration, future-oriented ideas based on a lifetime of synthesising science, participatory processes, and action for sustainability. The other book, Tackling Wicked Problems: Through the Transdisciplinary Imagination was published in 2010 by Earthscan, London. Val was the driving force behind this book, writing several chapters and coediting it. There were excellent reviews of the book, including one in Nature, and it won the Society for Human Ecology Gerald L. Young Book Award for the best human ecology text for 2011. It was the success of this book that put collective thinking on the agenda worldwide. While Val has been trailblazing collective action for human wellbeing and ecological sustainability worldwide, phrases from her publications have signalled how she champions transformational change, collective thinking and action, transdisciplinary inquiry and practice, whether it is in government circles, academia or local communities, or in the fields of eco-health, environmental management and land care. This lifetime of work and scholarship also well illustrates Val’s strong ethic of a just sustainable future for the whole of human society and including an abundance of life in all its richness and beauty. Val is also a gifted academic teacher and supervisor to what must now be close to a hundred PhD students. These students, and some are here today, have come to study with Val from around Australia and overseas. It is as the old saying goes: a student will find their teacher. I will let the students present tell of their encounters with Val. But I do need to say two things: first, Val seldom talks about her supervision of these students except to say how proud she is of them and of their ongoing contributions. Second, as a supervisor, Val is an excellent editor of their written work and has winning ways of enabling them to see their chosen topic from the multiple realities of a collective mind. Now, to gain some insight into how all this happened, I need to backtrack to Val’s earlier formative years and the unfolding of Val’s productive life. Val is a Queenslander by birth and a coasty by upbringing. Anything and everything about coasts and oceans and beaches energises Val. The ideal of a good time for the Brown family is to be within earshot of ocean waves with salt in one’s hair and sand between one’s toes. Swimming, surfing, sailing and snorkelling are popular pursuits. Val became a strong swimmer and swam for Olympic trials. Christmas and other celebrations for the Browns are a time to pause and head for the coast to collectively enjoy fish, oysters, prawns and other coastal delicacies. At the drop of a hat, Val still leaves Canberra for Batehaven on the NSW coast, where the Brown family have long protected a small sample of native spotted gum forest that surrounds their basic, no-frills accommodation, where she also talks to the trees. For Val, there are no bad days, only golden days, silver days and diamond days. Val’s first degree was in Botany and Zoology from the University of Queensland. It was as a university student that Val realised her interest in science and learning about the wider world. It was also on this campus that she fell in love with Robin Wallace Brown, and vice versa, a bond that lasts beyond his death, 53 years later. Val excelled in botany, winning the UQ Botany Prize. There was a story going round about Val that she was the most likely in her class to fail, she was having such a good time. Yet she turned the tables on that lecturer by topping the class. There is no doubt that Val’s almost perfect recall of what she reads helped her but there is more to her phenomenal memory than meets the eye. Firstly, it is underpinned by an insatiable curiosity and rich imagination, probably stimulated by her childhood at the coast in close proximity with nature and an early addiction to books. I doubt if Val was ever a passive observer of life: there were always questions that needed answers. Thus, this seeking and researching mind set forth from an early age observing and accumulating details about her adventures of life, living and learning. Secondly, there are Val’s enormous powers of concentration. There is the story of her undertaking an open book exam as an undergraduate where the class was given as much time as they liked to answer the exam questions. Everyone in her class had left after four hours but Val continued on, unconscious of the time, until she was sent home late in the afternoon. Thirdly, Val seems early on to have charged her memory to do pattern recognition. Val’s world is full of living and non-living patterns: trees, webs, waves, music, noise, scents, circles, physics and history are all recognisable patterns to be noticed. Val would grow up to become a master gardener tending to life’s patterns. Entering science as the first female research officer in CSIRO Plant and Soils Laboratory in the 1960s, Val worked on trace elements in grasses at the height of the triumphal stage of the Enlightenment era, when, as was the law at the time, she was forced to resign from CSIRO upon her marriage. A search for certainty and the banishment of ignorance was the primary aim of science at that time. Nevertheless, as we might expect, Val’s inquisitive mind was drawn to the then new field of ecology, where there was a focus on the changing patterns and processes of nature. Returning to academic life in 1970 to work on ecology, she found that issues of ecology and the environment were not readily resolved from within the scientific thinking of the time. The 1970s brought an explosion in systems research and people began to question the adequacy of the traditional scientific model to solve existing problems. It was also the height of the environmental crisis in Australia. The idea that long-term environmental problems (or wicked problems) were created by society and that society had to change to be able to find a resolution was a bitter pill for most people to swallow: but not for Val. She soon found a home with Professor Stephen Boyden in the then Human Sciences Program, now Human Ecology, at the Australian National University in Canberra and did a PhD entitled: Holism and the University Curriculum: Promise or Performance? Completing her PhD in 1978, Val drew the conclusion that while universities expressed the aim of addressing complex issues as a whole, in practice they remained strongly partitioned along disciplinary lines that were seen as essential for the university to function. The message was not entirely welcome. Her deputy vice-chancellor said that her thesis was tearing the university down brick by brick. The then psychology professor had copies of her thesis pulped. Val’s PhD was on research and teaching approaches in the field of human ecology worldwide. It was then that Val realised that each significant socio-biological issue raised six different types of question: empirical, social, aesthetic, ethical, introspective and reflective. For an effective and lasting decision, answers to all of the questions needed to be brought together, not one at a time, but within a holistic focus – the same theme of our book on harnessing the collective mind 35 years later. The task of bringing such collective thinking to science-based organisations would prove far from easy. On a more positive note, recognition of the validity of Val’s PhD findings led to an invitation to design a science degree in public health at the University of Canberra. The course was called Health Education and it is still running today, as Community Development. Val was also appointed to the national research bodies of the CSIRO and the National Health and Medical Research Council as the national community representative. On NH&MRC she was told by the Chair she couldn’t possibly be a good community representative, she was too well informed on the issues. At the same time she was Chair of Greenpeace Australia and busy organising the blocking of discharge pipes into Sydney Harbour and breaking the early silence on the Chernobyl explosion. It was now the early 1980s and, having become an advocate for linking research and practice, Val became Director, Health Advancement Services, of the ACT Health Authority from 1984 to 1990, practising what she had been preaching. It was here that Val learned the politics of change and, I am reliably informed, was sacked for introducing too many radical practices that had to be dismantled. The house that Val had built came tumbling down in 1990. Val then had had a new insight and vision about becoming a catalyst for change in the wider community of society. She took another path to tackling complex issues and social change. Instead of trying to reduce diversity and difference for change, Val wished to value diversity and difference and to tackle whole-of-community change. So she became an independent consultant and began to work with the local councils and communities in all states of Australia. This new drive for independence by Val brought with it the need for independent funding, so what did Val do? She became savvy about applying for grants and over the next decade or so would be awarded $25 million dollars of grants. But Val still needed a supportive base to work from, so when invited to become a visiting Fellow at the Centre for Resource and Environmental Studies, ANU, she accepted. Val told then Director Professor Henry Nix at their first meeting: ‘I wouldn’t be coming to just sit in a cupboard and think’. To which the Director replied: ‘That’s not what I would have expected of you, Val’. It was now 1990. Val was soon up and running in CRES and designed The Local Sustainability Project for working in partnership with local communities who accepted that whole-of community change was required if they were to achieve a sustainable future. There were local councils, professional communities of practice and communities of interests all involved in this collective action research program. Consistently, in seeking to address whole-of-community change, the same six types of questions arose: empirical, social, aesthetic, ethical, introspective and reflective. Val’s skill as an action-researcher and catalyst for change turned what most people saw as conflicting interests around the table into a celebration of diversity and an acceptance of complexity and uncertainty. In her book with fellow practitioner Judy Lambert, they describe each change initiative as a party, an opening night, a bon voyage, a house-warming. Durable relationships and positive social change flowed from her research long after she had left these communities to their own resources. Val put her energy into whole-of-community change in Asia and Europe as well as Australia. In Nepal her WHO project was to design a community health practice year for the first graduating class of doctors and nurses ever in Nepal. Nepalese doctors and nurses were trained in US hospitals and returned home to their country, where there were just two hospitals for 20 million people, as well as the worst public health profile in the world. It was what you could well call a wicked problem. The Local Sustainability Project found that answering all of the key questions required bringing together the interests of the individual, the community, the relevant specialists, the influential organisations and integrative thinkers. Each set of interests proved to have their own knowledge base, each their own goals and preferred sources of evidence, and even their own languages. Out of these studies came Val’s synthesising concept of knowledge cultures whose different and diverse interests were all necessary in order to achieve a sustainable outcome to complex issues. It is as though society had turned one’s natural human capacity to answer the suite of questions as a whole into separate knowledge cultures and that this was the answer to societal problems. Val once again saw further, to the potential of harnessing the human capacity for a collective mind itself as individuals and as a whole-of-society and I will pick up this vision in a moment. But first I need to tell you about two quite outstanding events that took place in Val’s life. In 1996, Val was invited to become the Foundation Professor of Environmental Health at the University of Western Sydney, Hawkesbury. Her whole-of-community research continued apace in this trailblazing post-graduate program and Val launched the inaugural Indigenous Environmental Health Officer Training Program. 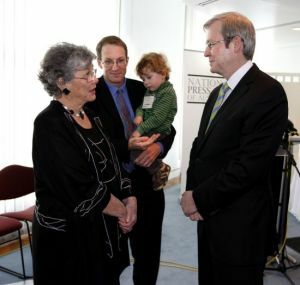 Then, in 1999, Val was made an Officer of the Order of Australia, for national and international contributions to policy, research education and advocacy for sustainable development. One might have thought that it was a good time for Val to chill out, to put her feet up, so to speak, but that is not Val’s way. In 2001, Val resigned her foundation professorship and returned to ANU as a visiting fellow in the now Fenner School of Environment and Society, which is continuing today. Professor Peter Kanowski, who was then Chair of Forestry invited her to join the faculty. As with her last invitation by Henry Nix, Val was up front, informing her new forestry boss: ‘But, Peter, I hug trees’ and, like Henry Nix before him, Peter’s reply was ‘That’s why I invited you’. Val still has her office in CRES today and still supervises ANU students. It is now, near the talk’s end, that I turn to Val as an exemplar of a mind and collective thinking. In our harnessing the collective-mind book, we found that, from Charles Darwin to each person alive today, there are five distinct self-contradictory elements of an individual collective mind. First, the capacity to absorb the ideas of other minds by studying their works or by developing close knowledge-creating relationships, while still retaining the capacity to strike out on one’s own as an original thinker. Second, there is the confidence in one’s own intuition, at the same time coupled to the accumulation of evidence from one’s own life experiences. The third element is the mental capacity for the reorientation of current paradoxes: parts and wholes, stability and change, individuals and society, objective and subjective, rational and creative. By treating each of these relationships as parts of a whole, one enters a third mental space, a new knowledge landscape and new sense of direction. The collective mind is then set to answer the full suite of questions necessary to tackle complex issues, which is the fourth element: these are the two inward-looking questions of introspection and reflection, and the five outward-looking physical, social, ethical, aesthetic and sympathetic questions. When all questions and answers are considered together as a whole they are capable of generating a synergistic leap in understanding. The fifth and final element of a collective mind is the constant association of abstract ideas and practical action. Throughout her working life, Val has combined a strong sense of independence with a collective thinking approach. Her work involved close and friendly collaboration with others in a wide variety of fields. By using collective-thinking exercises she found ways to stimulate people’s memories such that they were able to draw on qualitative and quantitative knowledge from their collective experiences within a real-world system of concern. Val also experienced first-hand how the relationships of any complex system were more significant than the content. Content can have disciples, be distorted or denied, whereas valuing relationships opens up the possibility of negotiation and cooperation as well as competition. A pathway can open where there was none before. Val has written that each of us has our own unique program of genes and signals from our nervous system that are the product of at least two million years of evolution. In our everyday experience of living, each of us is continually and effortlessly bringing all these signals into a collective whole that is uniquely our own. This forms our identity, our sense of self. By this sweep of her imagination, Val connects each of us to our evolutionary past and immediate present: to the possibility of finding our identity or sense of self as a collective mind. Val goes further towards imagining a collective future for humanity that is equally as sweeping and relevant to the present time. It is a grand narrative that extends Teilhard de Chardin’s suggestion that humans have moved from the biosphere to the noosphere (literally a global sphere of human minds). Today, human minds collect and connect with other minds in cyberspace as never before, on the internet and social media. Could this be a new evolutionary pathway for humankind? It is not clear yet, but should this happen, the collective mind becomes a possible way for humanity to share their thoughts and achieve some form of collective wisdom. To sum up, Val’s genius is her capacity to recognise and connect diverse patterns in time and space with the wide sweep of her imagination, and to see their relevance. This is her creative gift to us here today and to others around the world. Thank you, Val. Thanks also to everyone for being here today for this special occasion to celebrate Val: master gardener and enthusiast of life’s diverse patterns; action researcher and social activist; collective learner and catalyst for harnessing the collective mind towards a better world – one including the whole of humanity and an abundance of life in all its richness and beauty. *This presentation was given at the Mebourne Ecohealth Symposium by John A. Harris in December 2013.